The Busoga Kingdom, located in the Eastern part of Uganda across the Nile River, has a new king. 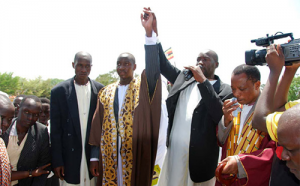 News broke yesterday that the Busoga Royal Chiefs council at last elected a new king. 10 out of the 11 traditional Busoga Chiefs were present at the council meeting, fulfilling the requirements for a quorum, and they then elected unopposed Prince William Nadiope Gabula IV as their new Kyabazinga. Fresh trouble however seems to brew already again for the kingdom as Prince Wambuzi, who was controversially elected in 2009 not long after the passing of the late Muloki, has threatened to go to court to stop the coronation as he considered himself as the rightfully elected monarch of the Busoga Kingdom. For now however, for all intent and purpose, Busoga finally has a new king again. Preparations will no doubt go into overdrive for the formal coronation which will be a major showcase event for Uganda as a whole and attract local, regional and international media coverage. The kings and cultural leaders of the other major kingdoms and chiefdom are all expected to attend the coronation and the date will be announced here to allow those interested in witnessing Uganda�s cultural heritage in action to come to the country and be among the spectators. Her Royal Highness the Nnabagereka (Queen) Sylvia Nagginda is the wife of the King of Buganda, King Ronald Muwenda Mutebi II. She is a traditional and cultural leader of the people of Buganda, the largest kingdom in Uganda occupying almost a quarter of the country with a population exceeding 5 million people. The total population of Uganda is 28 million. Her Royal Highness Sylvia Nagginda is the first Nnabagereka (Queen) in the history of the Buganda Kingdom to set up a fully-fledged Office, a very crucial phenomenon that has greatly complimented the ongoing development work in the Kingdom and Uganda at large. Her main focus areas are early childhood care and development; education for the girl child; vocational training and employment for the youth; empowerment of women, health issues particularly regarding the prevention and cure of childhood diseases, nutrition, and sexual reproductive health including the prevention of HIV/AIDS. A pillar of development, Her Royal Highness established the Nnabagereka Development Foundation (NDF) in 2000. The Foundation is a charitable Non-Governmental Organization whose mission is to restore the vitality of Buganda and Uganda at large by marshaling community and household human resources for social and economic development. The Nnabagereka is a Patron of several organizations including the Christian Children�s Fund (CCF) Uganda, Special Olympics Uganda, and Conservation Through Public Health (CTPH). She is also a Good Will Ambassador for the United Nations Fund for Population Activities (UNFPA). Held in high esteem and commanding a lot of respect among Ugandans, the Nnabagereka has worked passionately to fulfill her vision of uplifting the people�s standards of living. She has played a major role in sensitizing and mobilizing the general population on issues of education, health, poverty eradication, culture preservation, and has graciously supported and empowered marginalized groups as the youth, women and persons with disabilities. Uganda is made up of almost 40 different ethnic groups with 5.5 million, Baganda being the largest group constituting almost 20% of the total population of 28 million. Buganda Kingdom is the oldest Kingdom in the country. The years of political turmoil and civil strife in Uganda, and particularly in the Buganda region from 1966 to 1986, led to the collapse of the infrastructure, neglect of education and health and the decay of our moral fibre and values. Buganda, like many other areas that had traditional and cultural institutions, lost her Kingdom as well as her cherished cultural development, guidance and leadership. Traditional values and hard work were seriously affected. This coupled with the brain drain that ensued, incapacitated the economy leaving the majority of the society stricken by hunger, poverty, disease, ignorance, crime, and helplessness. The Baganda had no King for over 27 years until 1993 when the current King of Buganda, Kabaka Ronald Muwenda Mutebi II (son of Mutesa II) was restored as a cultural leader without political powers. The lineage of succession has not been broken for over 700 years. 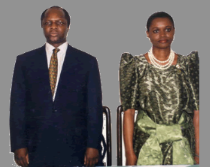 The Kabaka, is held in high esteem and commands great respect and authority among the Baganda and all Ugandans. The King uses his authority to mobilize people for development to ensure that the people of Buganda are united and are engaged in hard and productive work to uplift their social and economic well being. The years after the restoration of Kabakaship have had significant impact on the unity and social economic development of Buganda. The long forgotten �Bulungi Bwansi� (self-help spirit) is slowly returning to the people because of the Kabaka�s encouragement.